LONDON - Britain's Competition and Markets Authority watchdog on Thursday blocked the merger of supermarket giant Sainsbury's and Walmart-owned Asda, arguing it would result in higher prices and less choice. 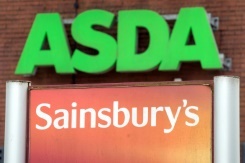 The deal has now floundered one year after Sainsbury's and Asda unveiled their merger plans, which sought to create a retail king to leapfrog UK number one Tesco. In reaction, Asda and Sainsbury's announced that they have "mutually agreed to terminate the transaction". The merger would have created a supermarket titan bigger than Tesco with a network of some 2,800 Sainsbury's, Asda and Argos stores. The sector also faces fierce competition from the likes of online US titan Amazon -- and German-owned discounters Aldi and Lidl. Police said they would talk to her relatives and friends to determine the cause behind the incident. The students body was found when police and rescue workers rushed to the condominium in Soi Bang Na Garden 10 at 7am. In another incident, a 19-year-old law freshman at university in Songkhla's Hat Yai district was found hanged in a toilet at a dormitory on campus on Thursday morning. He apparently left a goodbye message at 4am on Facebook apologising to his parents and friends for his solution to "personal problems”. Following the suicide report at 6am, rescue workers broke open the locked toilet door to reach Ekkarat (lats name withheld). Andre J Cointreau, President and CEO of Le Cordon Bleu International and Chanin Donavanik, Vice Chairman and Chairman of Executive Committee of Dusit International, celebrated the Grand Opening of the new Le Cordon Bleu Dusit Culinary School on Thursday. With a total investment of Bt300 million, and covering 3,000 square metres, the new school is located on the 17th to 19th floors of the Zen Tower, CentralWorld Complex, on Ratchadamri Road. It is the most modern culinary institute in the region. 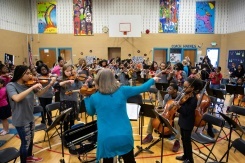 BALTIMORE - As the conductor raises her baton, dozens of children come to order, and their everyday cacophonous chatting gives way to a melodic cascade of notes. "We are trying to combat some of the social challenges here in Baltimore," says program director Nick Skinner. Gray fell into a coma while in police custody and later died, and the incident sparked violent protests in Baltimore, a port city plagued by violence, drugs and crime. Some of the OrchKids students have studied at the prestigious summer camp at the Interlochen Center for the Arts in Michigan. "I'd love Baltimore to become known as the City of Music rather than the City of Murder," she says. For men, the adaptable, everyday-use Aerantis is a new simple, elegant walking shoe that has curved lines and tonal colour matching. Inside, it conceals an air circulation system, built from a sophisticated mix of technologies. The star feature of the new Nexside model is the Side Transpiration System, a technology developed to ensure superior breathability through holes in the sides of the sole. What’s more, Nexside not only features the Inner Breathing System, but also the Ventilation Arch, a breathable mesh insert placed in the shoe over the arch. This mishmash of influences has been accented with small studs and golden pythonprint details. He began to show the extent of his extraordinary return to elite golf first in 2018, coming close to victory in two Majors before winning the Tour Championship. Eleven years since his last Major victory, and on the famed fairways of Augusta National where the Californian has won four times previously, the legendary golfer was rewarded for his exceptional perseverance. With this historic win, Woods has closed the gap on two longstanding records currently held by fellow Rolex Testimonee Jack Nicklaus of 18 career Major wins and six Masters victories. Joining Woods in the top 10 from the Rolex family were Australian Jason Day, USA’s Rickie Fowler and Brooks Koepka, and Spaniard Jon Rahm. Acknowledging the magnitude of his win after putting on the Green Jacket, Tiger Woods said: “It’s overwhelming. A still from a video clip showing a group of men butchering a barking deer and preparing a meal with the meat, in Bang Pa-in district, Ayutthaya province. 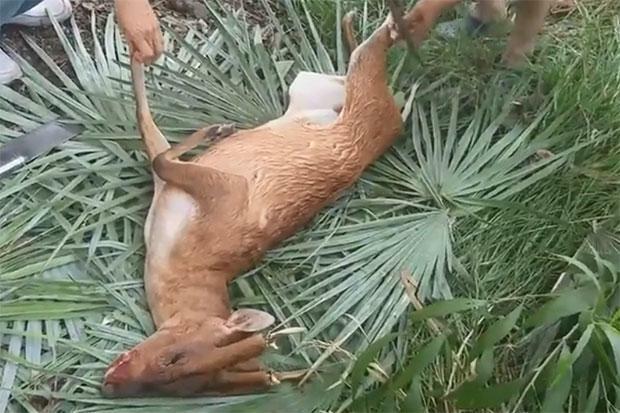 (Photo from video via Sunthorn Pongpao)AYUTTHAYA: A local builder has been arrested and charged after been seen in a video clip with other men butchering the carcass of a barking deer in preparation for cooking it, in Bang Pa-in district. They found barking deer hair and butchering knives in the house grounds. Police said Mr Panya confessed he bought a dead barking deer from a hunter in Saraburi province for 8,400 baht and took it to his home in Ayutthaya. He claimed he did not know the barking deer was a protected animal. The mall is Thailand’s first luxury mall outside Bangkok, which is equivalent to Central Embassy in Bangkok. Police believe Thongpoon Chanachan fell asleep behind the wheel and died instantly in the collision. He was taking the workers from Bangkok to renew their visa in Tak. Rescue workers had to use heavy equipment to extract two injured passengers from the wreckage. The other slightly injured passengers told police that they left Bangkok at 10.30pm on Wednesday to renew their visa in Tak's Mae Sot district. Police initially suspect that the van driver dozed off behind wheel due to exhaustion from a long drive. In 2018, Significantly, online sales surged by 23 per cent, representing a quarter of total sales. OfficeMate "Chat & Shop" or shopping via Line: @OfficeMate also boosted online sales, acting like a personal assistant to entrepreneurs and the purchasing units of enterprises. Wilawan Rerkriengkrai, President, OfficeMate Business at COL PCL, added that for the next 5 years (2019 – 2023), OfficeMate has set a growth target of 15 per cent per annum. OfficeMate has taken part in driving Thailand's economy with its investment of more than Bt1 billion to build the new smart warehouse. Using advanced technology and innovations, the new smart warehouse will upgrade service quality to deliver a better experience to corporate customers and SMEs. 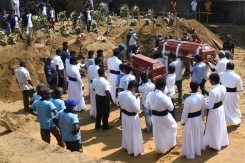 COLOMBO - Sri Lanka deployed thousands of troops overnight to help police search for suspects in Easter suicide bomb attacks claimed by the Islamic State group that killed nearly 360 people. Recriminations have flown since suicide bombers blew themselves up in luxury hotels and churches packed with Easter worshippers on Sunday. Overnight, security forces using newly granted powers under the country's state of emergency arrested 16 more suspects in connection with the attacks. "It was a major lapse in the sharing of information," deputy defence minister Ruwan Wijewardene conceded at a press conference on Wednesday. - Key suspect -An FBI team is now in Sri Lanka, Wijewardene said, and Britain, Australia and the United Arab Emirates have all offered intelligence help. The company has paid interim dividends in the amount of Bt0.50 per share. The retained dividend of Bt0.54 will be paid out on May 22, 2019. We have highlighted what you need to know about the iconic Royal Cliff Grand Hotel and why it might redefine your idea of a magical holiday:LocationThe Royal Cliff Grand Hotel under the award-winning Royal Cliff Hotels Group is situated on a 64-acre tropical estate overlooking the stunning Gulf of Thailand and offers spectacular views of both the mountain and the sea. 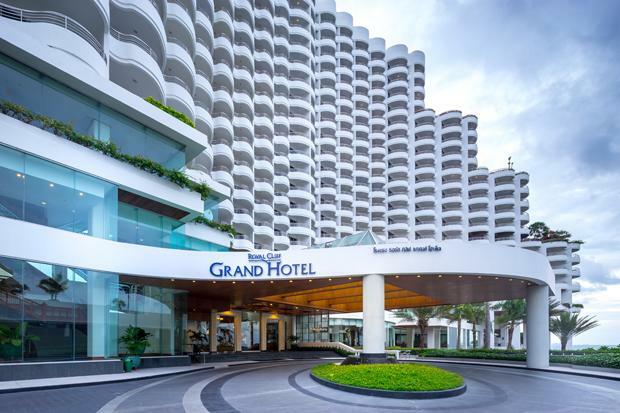 Design and CharacterA modern architectural wonder offering an authentic experience that reflects Thailand’s vibrant heritage, the Royal Cliff Grand Hotel fulfills every expectation implied by its name ‘Formal Luxury’. Ideal for both work and relaxation and built to accommodate business travelers, it’s resort-like ambiance and interior teak furnishings make it unlike any other business hotel you have stayed in. Now that we’ve put it all out there, it’s time for you to know firsthand what the Royal Cliff Grand Hotel has to offer! Book the Grand Experience Package and you will experience an enjoyable stay at the stunning Grand Sea View Plus along with exclusive special add-ons for only THB 5,000 net. 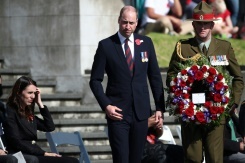 WELLINGTON - Britain's Prince William paid tribute to Australian and New Zealand troops on Thursday at an emotional Anzac Day ceremony, six weeks after the Christchurch mosques massacre. Still, the number of Anzac services in Auckland was reduced to avoid overstretching security forces. In New Zealand, Muslim youth association leader Azeem Zafarullah said it was important for the Muslim community to take part in the Anzac Day services, following the carnage in Christchurch. Prince William did not speak at the Anzac Day service but was expected to give an address when he meets with survivors of the mosque shootings in Christchurch on Friday. At the earlier dawn ceremony, Ardern said "our peace was altered dramatically by the terrorist attacks in Christchurch. Earlier this year, the Ministry of Tourism and Sports (MOTS) announced it is expecting more than 40 million tourists to Thailand this year, up from the record-breaking 38.3 million in 2018. In the first two months of 2019, the total number of Chinese tourist arrivals decreased slightly by 2.2 per cent Y-o-Y from 2.17 million in 2018 to 2.12 million. Chinese tourist arrivals in February, the month in which the Chinese New Year was celebrated this year, decreased by 12.3 per cent Y-o-Y. Looking back at 2018, there was a 23.8 per cent M-o-M jump in Chinese tourist arrivals from 0.97 million in January to 1.20 million in February. The number of international tourist arrivals to Bangkok in the first two months of 2019 as reported by MOTS was 4.68 million, a 3 per cent Y-o-Y growth.